Above: The first lap of Round One at Sebring International Raceway. 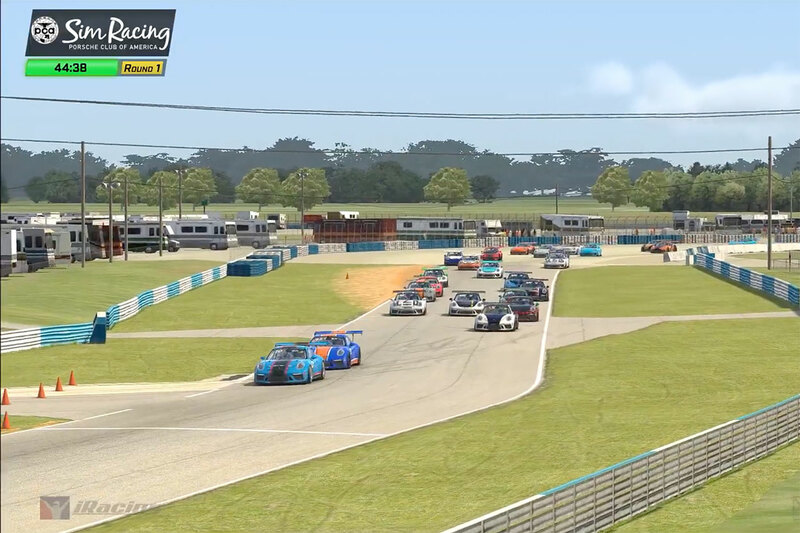 Billy Smith, II, of Maverick Region took first place at the inaugural PCA Sim Racing Series race at Sebring International Raceway, followed by Jason Lisner of First Settlers Region in second, and Michael Polasek of Northern New Jersey Region in third. Congratulations to the podium finishers! Round One of the highly-competitive PCA Sim Racing Series started with an exciting duel that lasted to the checkered flag. If you missed the race, watch it below. With the first race in the history books, the dynamic PCA Sim Racing Series now moves to the Circuit of The Americas for Round Two with a live broadcast Friday, March 8, 2019 at 9:15pm EST. The 45-minute race will feature professional broadcasters adding excitement to the racing action. Watch the live broadcast below or click here for the direct link to YouTube. This is the first officially sanctioned PCA National simulation racing series with 30 Porsche Club of America members racing door-to-door with fellow PCA members. Each of the eight consecutive weekly races will be live on YouTube. Championship standings and additional information can be found on PCASimRacing.org.